Title: TRAVELS IN NORTH AMERICA, from Modern Writers. With Remaks and Observations; exhibiting a connected view of the Geography and Present state of that Quarter of the Globe. By the Rev. William Bingley .. Designed for the Use of Young Persons. Description: London, Havey and Darton 1821-1823 Frontispiece + 2 further plates each with 3 illustrations, incl. Washington, New York, Philadelphia, Quebec etc. Vignette to title. . Duodecimo (192x111mm) original boards with spine label (worn and covers nearly detached/spine cracked to midline/dusty). 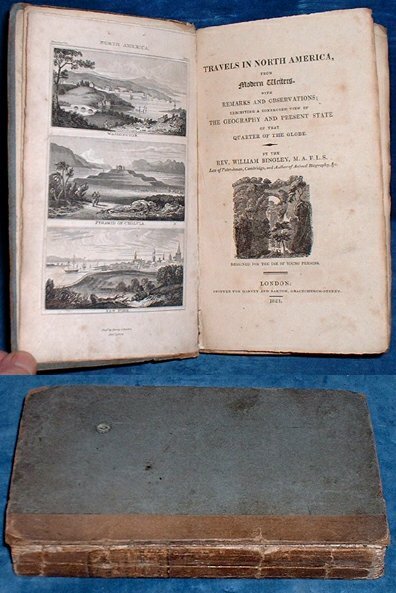 Half title +Frontis +Titlepage +extra titlepage "Modern Travels, through Every Important Country .. Vol.III North America" dated 1823 (as is the frontis) +pp adverts & plate list +2 plates +346pp +pp Works of Rev. Bingley. Uncut, light foxing mainly to beginning & end and a few openings where leaves/flowers left silhouettes, uncut edges bit dusty. *A nice copy of this quite scarce title, with detailed profusely illustrated description of North America for "young persons" (DARTON G104).